The most reliable early manuscripts of the Gospel of Mark end at verse 8. Other manuscripts include various endings to the Gospel. A few include both the “shorter ending” & the “longer ending”. The majority of manuscripts include the “longer ending” immediately after verse 8. The verse above does not specify the time of day. The scene is indoors in any case. Jesus is the primary source of light in this scene. From left to right: Simon/Peter, Bartholomew/Nathaniel, Andrew, Thomas/Didymus, Mary Magdalene (kneeling), James/Cleopas (son of Alphaeus), Philip (kneeling), Jesus the Christ (Messiah), Thaddaeus/Judas (son of James) (kneeling), Matthew/Levi, John (son of Zebedee), Simon the zealot (kneeling), James (son of Zebedee). The verse above is the shorter ending of Mark’s Gospel. 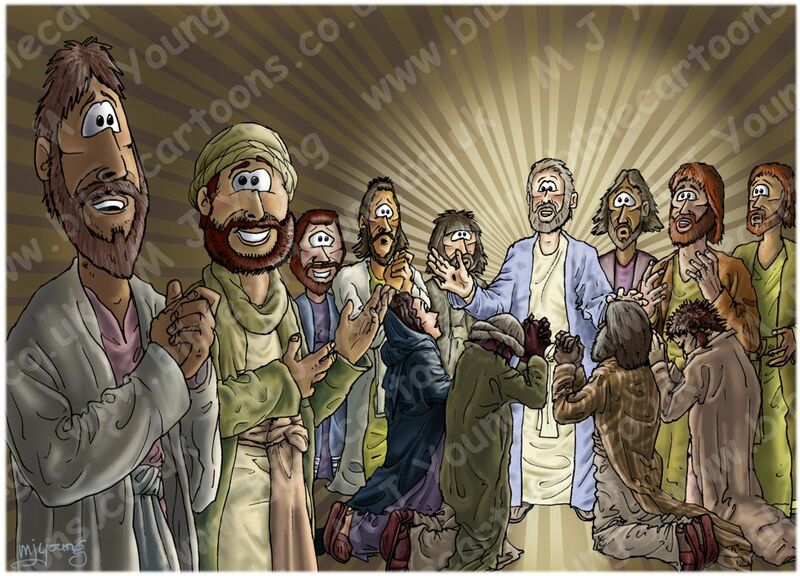 I wanted to show Jesus appearing to his 11 apostles/disciples (I have included Mary Magdalene amongst them) in a way that shows he is the resurrected Christ. I decided to make his over all appearance lighter than before his death & resurrection, but still have his clothes, skin & hair similar hues to those I have drawn before. I also added the radiating yellow/white lines (emanating from Jesus’ heart) to draw attention to Jesus, at the centre of the group of apostles. Jesus is the source of light in this scene, & in a figurative sense he is the light of the world & at the heart of the gospel message. I have not included Judas Iscariot (who betrayed Jesus to the authorities) who was the 12th apostle. Although Mark’s Gospel does tell us what happened to Judas after his betrayal of Jesus, Matthew 27:3–10 says that Judas committed suicide by hanging himself. The book of Acts states that Judas used the money he received from the Jewish authorities (30 pieces of silver) to buy a field, but then fell headfirst, and burst asunder in the midst, and all his bowels gushed out. Bearing this in mind it seems appropriate to leave him out of this scene, in which Jesus commissions his remaining disciples/apostles to spread his gospel message of salvation to the world. I had fun with the various expressions on the apostles/disciples faces. I particularly liked drawing Thomas/Didymus (4th from the left) with his wide-eyed, “O” mouthed expression! An echo of that sentiment can be seen on Matthew/Levi’s face (4th from the right) as he looks in amazement at the sudden appearance of Jesus. I took photo’s of myself in all these positions & poses to help me get the fabric folds right!